The Ryzen Threadripper 1950X is a monster of a processor. In fact, when we reviewed it back in August, it was the fastest desktop CPU we had ever tested. Its only drawback was the $1,000 price tag although even at that level, Threadripper provides performance that is a steal. It beat out the Core i9-7900X in every benchmark and still comes in $150 less than Intel’s offering. If you passed on picking up a Threadripper chip this summer because it was just out of your budget, now might be the right time to get one. The MSRP for the 1950X just dropped to $879.99. Amazon and Newegg both have them in stock as of writing. Keep in mind that the 1950X is not ideal for every rig, especially gaming machines. 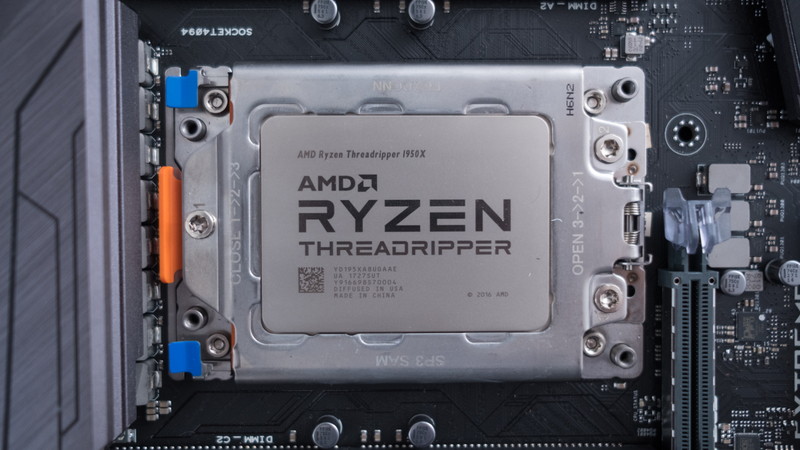 The Threadripper is just what its name implies – a multi-threading monster. It will definitely increase the efficiency of applications that utilize multiple threads and handles multitasking like nobody's business. Rendering and content creation processing time can be shredded with a 1950X, potentially shaving hours off your work time. However, when it comes to gaming performance, Threadripper is not the optimal choice. Most games do not benefit much from multi-threading. In our tests, the 1950X was outperformed by the Ryzen 7 1800X in almost every game we ran. Weighing in at only $400, the 1800X is unquestionably a better choice for gaming. That said, if you are looking for a multi-threading powerhouse, the 1950X can’t be beat, especially for under $900.